You need to learn how to be UNCOPYABLE ! Simply improving your products and services is a losing proposition these days. Improvement is short-term, because you’re making it EASY for the competition to catch you. Your objective isn’t just to be better than the competition in your market’s eye. It’s to be … UNCOPYABLY SUPERIOR. And that’s what Steve Miller is all about. Teaching businesses how to be UNCOPYABLE by establishing a well-orchestrated brand through meaningful and relevant innovation. 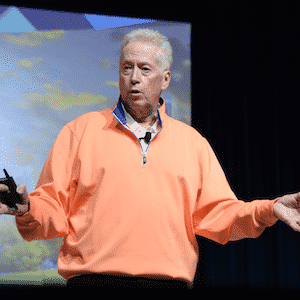 Organizations who book Steve Miller to speak at their events learn this… all this wrapped in a highly interactive, customized, educational, entertaining, and (dare we say it? ), motivating experience. A “gunslinger” who has walked the talk, Steve’s expertise is based on years of working in Corporate America – from his start as a newbie salesperson for a small Tucson radio station to becoming the VP of International Sales and Marketing for a Japanese toy company to advising Fortune 500 CEOs and entrepreneurs. 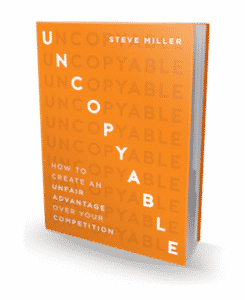 Contact Steve today and learn how to be UNCOPYABLE. I’ve known Steve for many years – he’s one of the best marketers out there. He’s unique because he walks the talk; he’s been a successful business owner for 30 years. As a speaker, Steve Miller has a powerful message that he tailors to each audience. He uses personal stories, real-world examples and humor to reinforce his mantra: Better isn’t good enough. The “Uncopyable” message hits home with audiences, and they walk away with new eyes, and tools they can use right away to help make their own businesses Uncopyable. Steve grabs the audience’s attention from the moment he starts. He’s funny and relatable – but more important, his Uncopyable message is a whole new way of thinking about marketing in a competitive world. His message inspired us to take steps to be “Uncopyable – including the development of marketing tools that have resulted in an unbelievable year–over-year revenue increase of 1879.1%! (Yes, you read that right!). Our results are a testament to the power of Steve Miller’s message. Steve did a knock-out, home run, triple, fantastic, out of the park, whatever analogy you want to use because he had the audience engaged. He used practical applications and real-world case-studies to explain that the experience is the marketing. If you’re looking for someone who really does bring a different perspective to marketing, that person is Steve Miller.